Common to all creatures, man and beast alike, eating and drinking are mere matters of material survival. One would not think there could be anything spiritual about something that dogs do, too. Yet one of many mind-blowing Biblical verses reveals quite the opposite: “And they saw God, and did eat and drink” (Exodus 24:11). This verse refers to Moses and the priests and seventy elders who ascended Mount Sinai. One might think that it is odd that these men occupied themselves with this “lowly physical act” on the occasion of seeing God, instead of falling on their knees in prayer and praise or being knocked out flat in amazement and awe. This episode is one striking expression of the unity of God and man, the meeting point of the earthly and the Divine. In fact, the invitation to dine at the Lord’s Table demands that everything in the life of man ought to be sanctified, even those “fleshly” acts. Although we do the same things that animals do, we do not do them in the same way because we have seen God. A cat will protect its dish of food from its hungry brother in a bold and unashamed- even unconscious- demonstration of selfishness. Humans would probably behave the same way if it was not for the knowledge of God, the creator and provider for all flesh, who advocates caring and sharing and not exaggerating the pleasure of the flesh. Food is indeed the most basic commodity we are required to share and the most urgent for the needy. The way we treat one another is the way we treat God. This message made explicitly clear by Yeshua also explains the deep meaning behind the Sinai encounter of “seeing” God while sharing a meal together. “Taste and see that the Lord is good” says the Psalmist (34:9) in another expression of this mystery. What is it that we should taste to see the goodness of the Lord? It is His own offering, the Passover Lamb, the Bread of Life through which we can “see” God and His goodness. The “mystical” idea of “eating the Messiah” and of internalizing the experience of salvation upon seeing God comes to its ultimate conclusion on that Passover night when the Lamb offered Himself to be “eaten” by His disciples, and subsequently by all humans, an idea that was admittedly shocking to them and a stumbling block to many to this day. Interestingly enough, it is worthwhile to note that it is not by coincidence that the Hebrew words basar (flesh) and Besorah (the Good News) have a common root. Yeshua was aware of that, no doubt. This is just a bit of “food for thought.” It is not in the metaphysical realm that this issue of TFZ intends to dwell, however. As the Besora needs to be manifested in the basar, the idea made into flesh, in the same manner is God’s Spirit manifested in the very important place given to matters of eating and drinking in His Word, which relates in great detail even to our everyday habits. 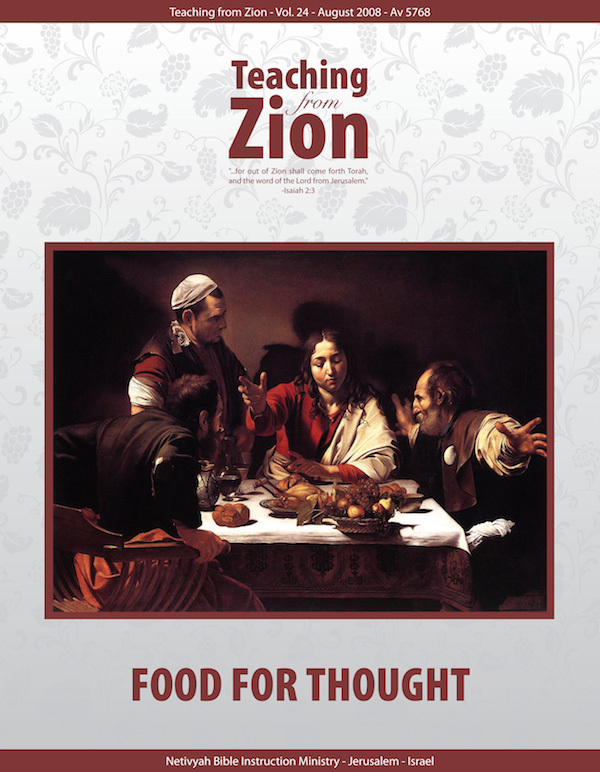 We feel that there are some badly missed points concerning this issue among New Testament readers which will be the focus of our attention, along with other aspects of the Biblical attitudes to matters such as kashrut and animal welfare, themes that concern us today even more than in ancient times. Additionally, in order to make sure that all this “spiritual” material goes down well, some reviving recipes are included. Taste and see that the Lord is good!